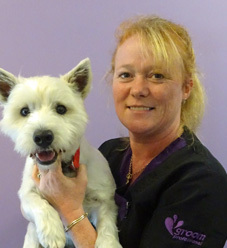 Qualified in 2003, Jo opened Bonnie Dogs as a Mobile Dog Grooming Service across Surrey. Following its success the Dog Grooming Salon in Bookham, Surrey was opened in 2010. Jo is always complimented on her level of patience with the excitable and those few grumpy dogs that we see from time to time. Jo has over the years turned scared, nervous dogs that have to be muzzled into dogs that bound through the door only to be cuddled. She has a real passion not just for dogs but for their welfare, happiness and loves nothing more than to see a dog relaxed and happy to be groomed throughout their life. Jo has over 18 years experience of owning her own dogs most of them rescue dogs so is always on hand to help owners with any problems they need sharing. Even after over 14 years of grooming thousands of dogs of all sizes, breeds and temperaments, Jo still loves her job and will treat your dog with the same care and attention as she does her own. 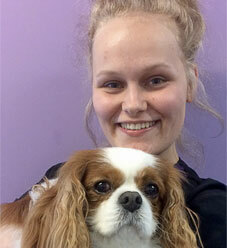 Paige is currently completing her Level 3 Animal Care – Dog Grooming Apprenticeship with us. With over two years Salon experience Paige is already a valued member of our team. The dogs are in good hands with Paige as she really does care for them all as she would her own dog. You can often hear her having a chat and a good chuckle with the dogs when she thinks no one is listening! Paige’s grooming skills are improving daily and with her attention to detail she really will be a fantastic Groomer. Jess takes great pleasure in getting your dog looking fabulous and works hard to ensure your dog leaves looking their best. Currently studying for her HND Level 5 Animal Management Jess is enjoying the hands on experience she is gaining while she decides which career path to take. 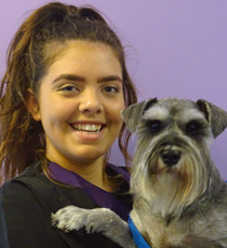 We would like to see her stay with Dog Grooming as she has become a valued member of the team who treats all the dogs with the highest level of care. Saskia loves nothing more than cuddling your dog rather than bathing them! Saskia is learning the ropes to assist to maintain our very high standard required to ensure your dog receives the best care at all times. Siobhan started with us for her Work Experience and has not wanted to leave. Siobhan just adores dogs, you will find her cuddling them at every opportunity. Siobhan always gives your dog 100% of her attention and works very hard to ensure your dog is looked after to the best of her ability. 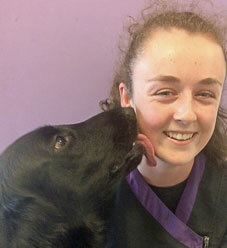 Siobhan is currently studying Level 3 Animal Management and we really hope she makes the career choice to stay in Dog Grooming as the dogs just love her back with the same enthusiasm as she has for them. 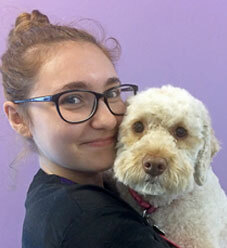 We require a Dog Grooming Assistant on Thursdays and Fridays. Ideally we would like you to have worked with dogs but no experience is necessary as full training will be given. This is a very physical job so you must be prepared for hard work. If you are interested in this position please email us enquiries@bonniedogs.co.uk or pop in to the Salon to pick up an Application Form. We look forward to hearing from you. Legend the Flatcoated Retriever and Daz the crossbreed from Battersea Dogs & Cats Home are often out in the back office sleeping. They are both very friendly and will occasionally pop their heads out to say hello.